Institutions are required to submit action plans by year’s end and are expected to meet their diversity targets by December 2019. 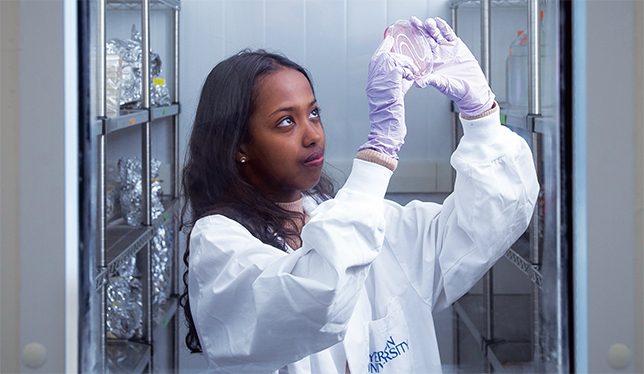 A student examines a lab experiment at Ryerson University. Photo by Kevin Vanpassen. While checking Twitter one day this past July, Danika Goosney came across a story that reminded her why equity policies exist in academia. A Toronto-based health researcher had reached out to the organizers of a large international conference to ask about bringing her breastfeeding newborn to the event. Their response: Sorry, no kids under 18 allowed. For Dr. Goosney, the slight against the researcher reflects a wider bias against women in the workplace and serves as an example of the barriers to advancement women and other historically marginalized groups in academia experience throughout their careers. It’s because of these persistent challenges that the Canada Research Chairs program – one of the most important faculty recruiting tools for Canada’s university sector – introduced an equity, diversity and inclusion action plan in May. It is the program’s biggest move yet in its push for better representation of four designated groups – women, Indigenous people, visible minorities and people with disabilities – at the highest levels of Canadian research. “There are many excellent, meritorious candidates that face biases – unconscious, conscious, systematic – across the board and we’re trying to take measures to ensure that all of our excellent candidates have the same opportunity to be nominated for and receive these awards,” said Dr. Goosney, who is executive director of the Tri-Agency Institutional Programs Secretariat, the body responsible for administering the CRC program. Under the new measures, universities with five or more chairholders are expected by October 27 to have posted to their websites a statement of commitment to equity and inclusion, a plan on how equity concerns will be handled and reported within the institution, and other details aimed at improving awareness and public accountability. By December, they will have to submit an action plan to the secretariat outlining how they will counter the low numbers of chairholders from the four designated groups at their institutions. Dr. Goosney said the exercise will require senior university leaders to reflect on possible problems with their recruitment and appointment practices, and how these can be corrected. The institutions will report back to the secretariat annually on their equity target results and will now have to post this information to their websites. The secretariat won’t process any new chair nominations for an institution until it has met these requirements. All institutions with CRC chairholders are expected to meet their diversity targets by December 2019. For Malinda Smith, a professor of political science at the University of Alberta, the action plan is a sign that, at the very least, “universities haven’t taken equity seriously at that level.” She noted that it has been 30 years since the federal Employment Equity Act required employers to be proactive in their hiring from the four designated groups. “I’m not persuaded that we would be so stalled [in meeting equity targets] if in fact we had leaders who were actually, in their daily work and performance … committed to equity and diversity,” she said. The equity targets came out of a 2006 settlement with eight women who brought a discrimination complaint against the CRC program to the Canadian Human Rights Commission. The settlement meant that any university participating in the chairs program would have to comply with the Employment Equity Act. Around 2010, the secretariat set actual targets for each equity-seeking group identified under the law. These targets are reviewed and revised every three years. To enforce and promote the policy, the secretariat began randomly monitoring institutions’ nomination processes and introduced an annual recognition program for institutions that have exemplary equity and inclusion practices. Despite these efforts, most universities still fall short of their equity targets. (Of the 1,615 chairs filled as of May 2017, for example, only 30 percent are held by women.) In 2014, the secretariat began including clear guidelines on how to counter unconscious bias, especially towards women, when writing letters of reference. Two years later, Ted Hewitt, president of the Social Sciences and Humanities Research Council, published an open letter calling for university presidents to “sustain and intensify efforts, in order to address, as soon as possible, the under-representation of individuals from the four designated groups” in their chair nominations. The secretariat also posted to its website specific targets and results for each institution participating in the CRC program – a move that the secretariat says improves transparency and accountability, and that others in the university sector have called a “name and shame” approach. Publishing that data served as a prelude to an external assessment of the CRCs for the program’s 15th anniversary in 2015. That report, published in 2016, recommended that institutions be more transparent in how they allocate their chairs to ensure that they meet their targets. The equity action plan released this spring was largely developed out of this recommendation. While most researchers and university administrators support stronger equity policies and practices within the CRC program, Dr. Goel suggested that the way at least one of the targets has been calculated makes it difficult to comply. He said the disability target is particularly challenging in part because it is based on data from the 2006 Participation and Activity Limitation Survey by Statistics Canada. The survey generally defines disability as any condition that impacts daily activities, a much more liberal interpretation of disability than most people tend to have, he said. “To give a simple example: using a cane for mobility would correspond to the StatsCan definition of being disabled, but a faculty member who feels they’re able to get around and do their work may not necessarily think that they’re disabled for the purposes of declaring for the CRC competition,” he said. The CRC program is currently reviewing the method it uses to calculate equity targets, in part to integrate new data from the recently reinstated University and College Academic Staff System survey, said the secretariat’s Dr. Goosney. Over the summer, the secretariat also initiated public consultations with CRC stakeholders through meetings and an online feedback form. Any changes to the program that come out of these reviews will be implemented in 2018, she said.